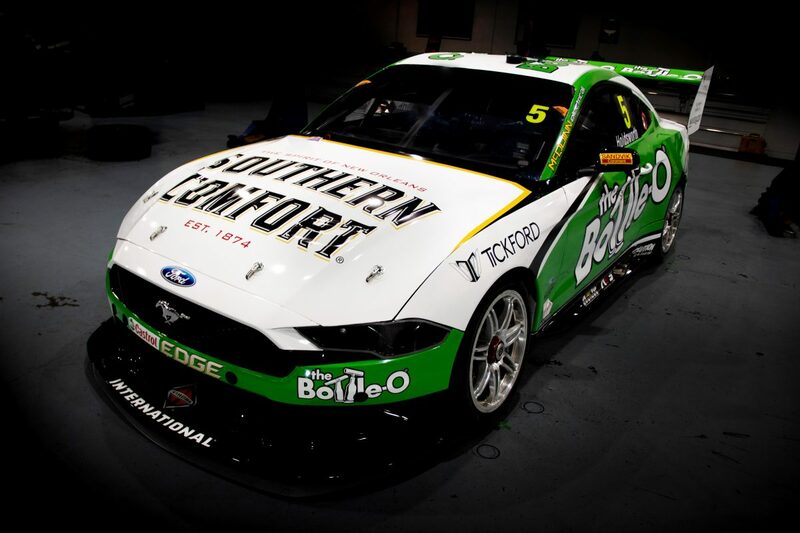 I don't dislike that Matt Sone Hazlewood livery. A bit of a worry when the bulk of the signage is given to the team name over commercial backers which only get minimal signage. Hope that doesn't mean an underfunded programme. The DJR livery is a bit same old same old, but I guess restricted by the Shell backing. So probably a good time to summarize the grid for 2019. Macauley Jones and Jacobsen being new blood in, and Tander Blanchard and Lowndes the three no longer in. Otherwise just a couple of movers from team to team, with Holdsworth and Winterbottom playing swapsies. In the other categories, good to see TCR, having its debut in Australia, has confirmed it has secured live FTA TV Coverage. They are certainly doing the right thing and this will no doubt help boost the grid numbers with TV exposure the key for potential sponsors. Also good is that it will include the great Aus GT Category. 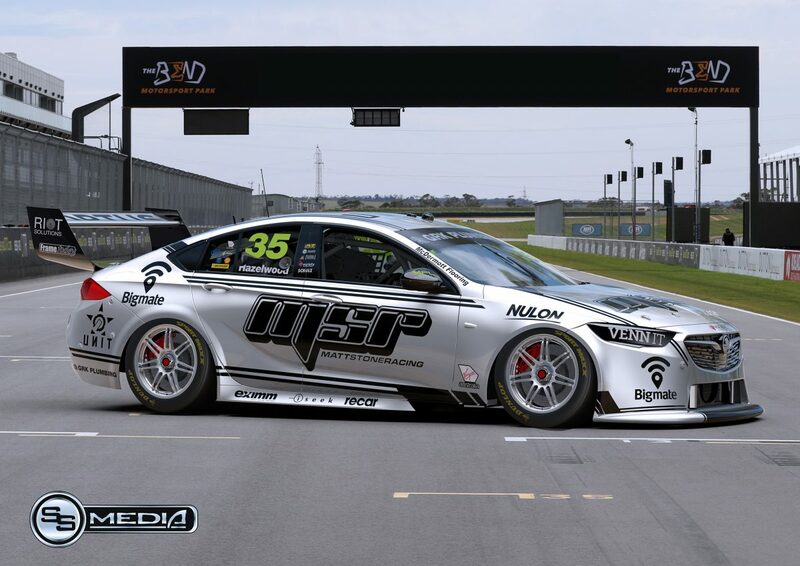 “From a Shannons point of view and our categories, of which (Australian) GT is one, and GT3 (Cup Challenge), but also TCR, it’s really good to get free-to-air live coverage,” CAMS general manager of motorsport Mike Smith said. 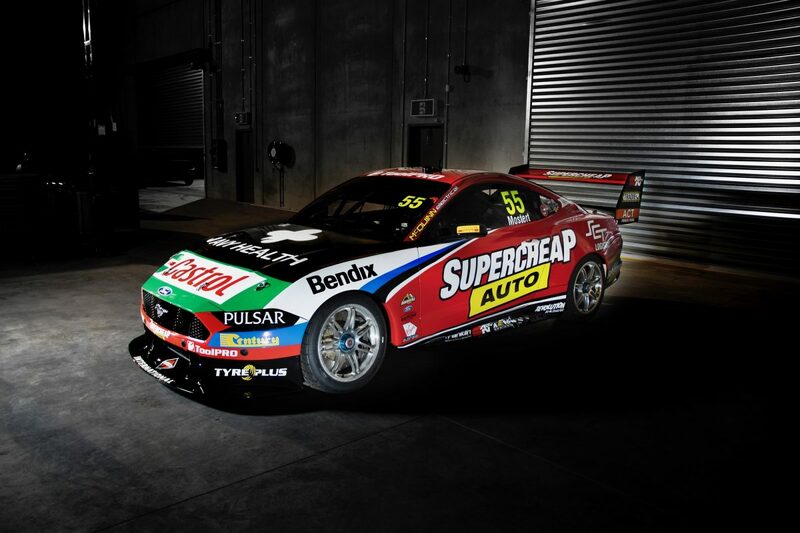 And the #55 Supercheap Mustang for Mostert which I think looks very ordinary... a bit like someone has wandered round the car with a handful of stickers placing them where they sort of fit. 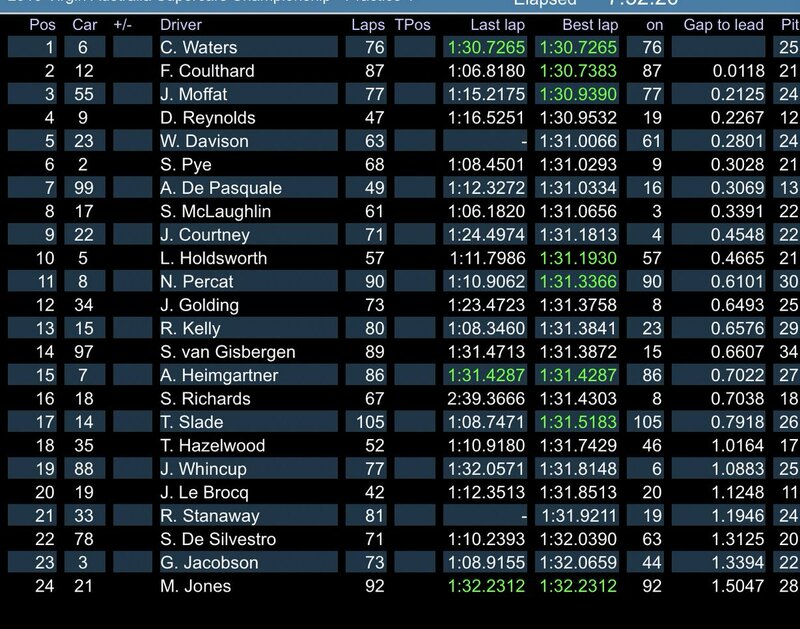 All of the cars (most anyway) are testing at Phillip Island today in the Supercars pre season test day. Actually just seen on Natsoft that 24 cars have recorded a time so far and it is only 10.00am. To date the Shell Mustangs of Scotty Mac and Coulthard are 2nd and 3rd fastest with the Commodore of Pye a few thou quicker. Top 4 covered by 5/100ths. I think Scott might be playing games a bit because he set his quickest lap on only his third lap.... since then he has been going fastest in S1 and S2 then slowing in S3. Erebus had to pack up and go home at lunchtime because their cars exceeded noise restrictions. According to team boss Barry Ryan, the cars are unchanged from last year with regard to the exhaust system and engine, which has left the team perplexed by the issue. The PI test ended up with the Mustangs taking the top 3 times. I know the fastest car, Cam Waters in the Monster Mustang, set his time in the dying seconds of the session using low fuel and green tyres, whereas given the track was fairly quiet at the end I am not sure if others used new tyres although a number of personal bests were set. I know Scotty Mac didnt.... in fact he only did installation in/out laps for the last part of the session. It was reflected in his 8th fastest time. Shell DJRTP team mate Coulthard spent some time at the top of the sheets in the afternoon, and was beaten by Waters in the final seconds as mentioned. James Moffar finished 3rd in Chas Mostert's #55 Supercheap Mustang that he will share with Chaz come enduro time. The Red Bulls were another team not setting the time sheets alight, with SVG 14th and Whincup 19th. Anyway here are the times from the end of the day. I don't dislike that Matt Stone Hazlewood livery. A bit of a worry when the bulk of the signage is given to the team name over commercial backers which only get minimal signage. Hope that doesn't mean an underfunded programme. Jason Gomershall buys into MSR as equity partner. Long time MSR benefactor Jason Gomershall has become an equity partner in MSR. Not surprising really, as he has a long association with the team, and MSR built and run his Touring Car Masters Torana entry. I believe some of the minor sponsors already on the car are Gomershall businesses as well. Certainly iSeek are. Jason was also a backer of the MSR/Hazlewood Super 2 championship win. “Matt Stone has helped me live my dream to competitively race against some of the best names in Australian motorsport,” said Gomersall. Team principal Matt Stone is pleased to have Gomersall, who is the founder of ICT business iSeek Communucations, play a bigger part in the business. “We are proud of the relationship we have built with Jason. It was with his support that we stepped up to the 2018 Virgin Australia Supercars Championship,” said Stone. 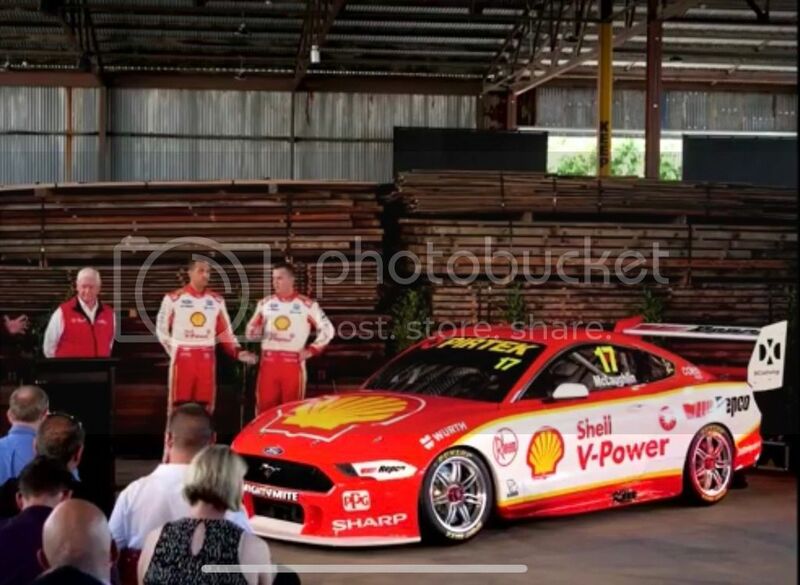 Here we have the perfect retro round Ford for 2019. I did not pick that at first. I still think the rear wing endplates are a bit hideous looking. The NSW government has invested in Eastern Creek to put permanent lights towers around the circuit as part of a deal to have the series return in 2020. 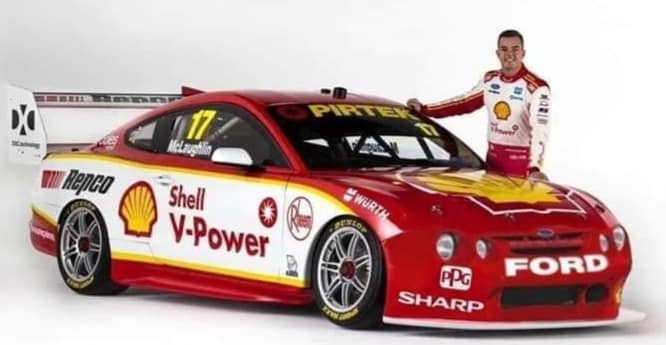 The Grand Tour's test driver Abbie Eaton will be racing in Super2 this weekend driving Matt Stone's 2017 Super2 championship winning Commodore. This weekend the season finally starts with the Adelaide 500. There is an Aussie Racing Cars race on today and tommorow there will be a number of support categories racing (including Super2) before the first race of the main series season on Saturday. The forecast for the weekend is that it will be very hot on Friday and Saturday with a maximum of 40 degrees Celsius which will make driver cooling a very important issue. Sunday is supposed to see a reprieve with temperatures dropping to 31. There has been a noticeable change to the track with turn 7 being narrowed considerably by a moving of the outside wall. This is mostly to stop people jumping the curb there and also to slow down the cars heading into turn 8 slightly, but it does mean that there is a lot less room for error there which will probably result in an accident at some point.